Lato w North Fish! | North Food Polska S.A. The menu now also includes Fish & Chips, tasty halibut in a delicate batter with tartar sauce. Our famous refreshing Aloe Vera & Chia drink is also returning for the summer. And for dessert we recommend something else new – Panna Cotta with raspberry mousse. 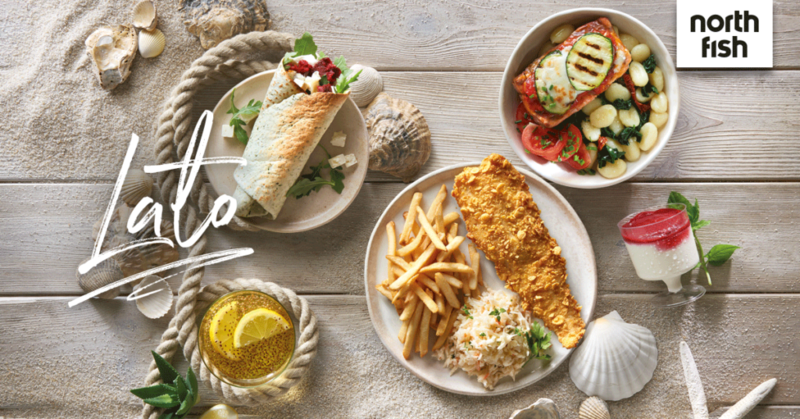 The Summer Offer is available at all North Fish restaurants until 26.08.2018. North Fish is a chain of restaurants specialising in fish and seafood. The first was opened in 2002 in the Galeria Echo shopping centre in Kielce. Currently North Fish operates 44 restaurants located in Poland’s best shopping centres, which makes it the country’s unquestioned leader and Europe’s second largest, chain of restaurants offering fish and seafood. Each day nearly 1,000 employees take care to ensure the highest quality of the products served.